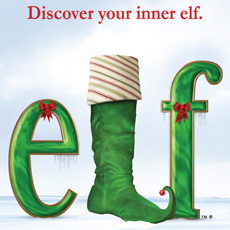 Based on the motion picture of the same name, Elf: The Musical takes us on a journey to discover the true meaning of Christmas..
As the story unfolds… William “Buddy” Hobbs, a young orphan boy, finds himself at the North Pole after he accidentally crawls into Santa’s toy sack. Years later, Buddy learns he is actually a human and is granted Santa’s permission to go back to New York to find his father. Buddy is successful in locating his father, Walter, but finds his father, brother and most of New York not believing in the spirit of Christmas…he is determined to help them all believe in the true meaning of the holiday!